With help from this handy document here. A lot of the experience and gold amounts don't seem to match up with my results from the game, so I'll probably be revising this in the near future. Quick note: Enemies denoted in italics are bosses and mini-bosses. The bosses at the end of areas are, of course, area bosses. The first enemy you'll encounter. (Besides the Dummy, I guess.) Froggits send out flies to attack and can leap at you. They're generally pretty weak. One of the weakest guys in the game. Whimsuns will not hurt you unless you move around, as their butterflies patrol the outer limits of your movement only. They're marginally more dangerous if you encounter 'em with other enemies. Squish. Moldsmals hurl pellets at you, of the floaty and the explodey variety. No big deal. What a crabby-looking fellow. While there are other monsters on the screen, Migosp will drop roaches out of both sides of the box. Once it's alone, Migosp will simply dance. A cyclopian soul. Looxes will send weaving projectiles your way; some bounce, some don't. Fairly standard. Fulsome veggies that like to throw more of themselves at you. More dangerous than most Ruins enemies because of the volume of their attacks, but still pretty tame. If you choose the Dinner Action they'll drop green, restorative vegetables during their next attack. The first 'boss' you'll encounter. Napstablook cries his way through his battles, and will either shower you from above, hit you with curving tears, or just waste his turn. Cheer incessantly for a merciful win. 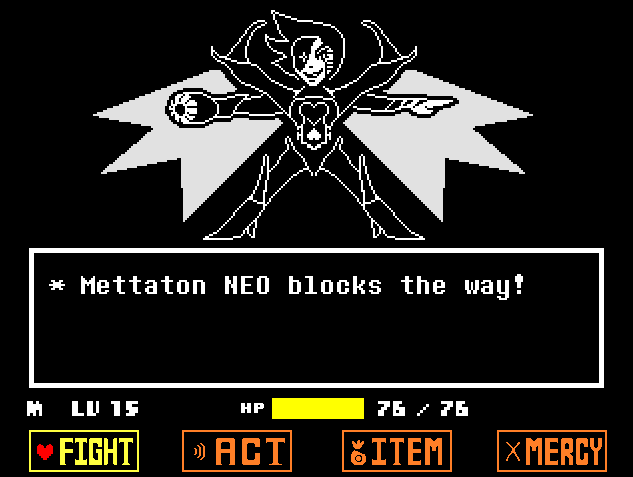 Though she's the first difficult enemy you fight, Toriel is essentially harmless. Once you get weak enough her attacks will automatically miss you. You can then slash or Spare her into submission. Snowdrakes like to attack you with curving attacks. No biggie, to be honest. You can't Spare them properly until they tell a joke, and Checking will give 'em the chance to do so. Chilldrakes are functionally identical to Snowdrakes, just more serious. Hence, different Mercy move. Ignore that wonderful hat. Ice Caps force you to weave through a zigzag corridor, and they'll fire icicles upwards at you. Easy. If you Ignore twice and then Steal you can turn them into Ice; Ice gives 25 experience and 40 gold instead. Worth the extra turn whether you intend to kill it or not. ... huh. Lesser Dog gets super excited, and will leap at you during battle. Pet it over and over and... well, you'll see what happens. The more you Pet, the better the results. Depending on how much you Pet, the sculptures later in Snowdin will look different. There is only one Lesser Dog per game. Jerry. This irritating beast doesn't attack - he just extends the attacks of other monsters by a few seconds. As far as I know you can't properly Spare Jerry, and the only way to get his gold is to kill him. (Which takes a while.) Note that you need to Ditch Jerry as the battle's last action, or he'll come back the next round. An odd beast whom people unfortunately decided to decorate. Gyftrot drops snow on you; weave away at the bottom of the screen. As a bit of goofiness, you can Decorate Gyftrot... but it will add more rounds to the battle, 'cause then you have to Undecorate the stuff you added. The mighty axe-wielders of Snowdin. Dogamy and Dogaressa are functionally identical, and use team attacks to take you down. They're pretty easy... so long as you don't kill 'em. Even then, if you kill Dogaressa first, Dogamy becomes an absolute wimp. Kill Dogamy first, though, and Dogaressa becomes a brutal opponent. Take her down first if you want to win violently. Hefty fella. The Greater Dog uses a spear attack that you can avoid by strategically stopping, as well as a barking attack that you'll just have to dodge. The animation after the battle changes depending on which Mercy option you choose. The second major boss. Papyrus uses a series of horizontal, sliding bone attacks. Treat fighting him like playing a side-scrolling game and you should be fine. Whether you attack him or just wait him out, Papyrus will give you the option to Spare him at the end of the fight. It's generally a bit faster to just beat him up, regardless of how you want to end the fight. A horse with muscles for days. Aaron will sweat on you and try to squish you to death with his muscles. Staying high in both cases is a bit easier. If you don't want to risk killing an Aaron on a Pacifist run using the normal Mercy technique, you can Flex three times to eject Aaron from the battle instead. Some kind of washing tub? Woshuas shoot cleansing soap at you, either in bouncy form or as controlled bursts. You must touch one of the green suds that fire from Woshua when you choose Clean or you won't get the option to Spare. Shyren's an odd duck. She likes to hum notes at you. These are feeble at first, but every time you Hum her output gets faster and faster. If you Hum enough times she'll leave on her own. Moldbyggs appear as Moldsmals at first, though they don't move around. They won't reveal themselves until struck or otherwise interacted with. Then they'll begin trying to pelt you with projectiles. Not too difficult. hOi!!1! The Temmie is a single-shot, unique monster with a really dumb walking attack. Shrug. You can feed it Tem Flakes, if you like, though... you don't really seem to get much out of the deal... regardless, if you kill the Temmie, you'll never see it again. The Mad Dummy lives up to his name. He employs a series of smaller, more temperate dummies to attack you, typically launching cotton ball-esque projectiles your way. You need to lead the projectiles in the Mad Dummy's path so they hit him instead, as your own attacks won't hurt him at all. Eventually the Dummy will resort to missiles, though by then the battle's scripted and you don't really need to hit him anymore. One of the more difficult bosses. Undyne launches a series of dart attacks at you, and you need to move your shield around to block them before they hit you. This gets trickier as she launches them in tighter clusters, with greater speed, and with yellow darts that swap sides thrown in for good fun. Undyne also uses flying spears to hit you, and will occasionally force you into a much smaller box to avoid upward-thrusting spears. The only way to Mercifully win is to hold out until she gets frustrated, then Flee. She'll chase you for a while, but you can Flee more or less automatically from then on. Undyne has two additional Actions: Challenge and Plead. If you Challenge, she'll increase her attack speed for the round. If you Plead, there's a chance she will slow down her attacks instead. One of two incredibly difficult bosses who appears during a Genocide run. A full breakdown on how to beat her appears here. A volcano-esque beast who happily launches projectiles at you from the sides of the screen. Encourage will make these projectiles launch more vigorously. Adorable. Tough little Tsunderplane will hit you with vertical jets that spout horizontal fumes, as well as bombs from above. The latter is more dangerous. What a hot-head. Pyropes send flamey rope things at you horizontally; you need to pass through the flames to avoid damage. They'll also drop bombs, which you just need to avoid. Muffet's a friend to spiders, and since you're apparently not, she thinks very little of you. Her attacks are all line-based, and you need to hop between three or more horizontal lines to avoid her army of spiders, croissants, and enormous pets. Not much to say beyond avoiding everything as best you can. There are three ways to end the fight: kill her, wait her out, or present a 'Spider' item during the battle, namely a Spider Donut or a Spider Cider. If you bought anything at her bake sale you can also avoid the fight entirely, though those items are wicked expensive. Yay, magic! Madjick uses attacks that fire from corners and try to follow you around the room. Mildly intense, but not a huge deal. So mighty they had to say its name twice. Knight Knight employs copious projectile attacks, as well as trying to stab you from the north and south with huge spears. If you engaged in a singing career with Shyren you can put it to sleep by Singing twice; otherwise you'll need an extra turn. A support enemy. Whimsalot surrounds you with fluttering butterflies. It's not terribly dangerous on its own, but its butterflies make other enemy attacks much more dangerous. Flies and frogs! The Final Froggit is a more intense version of the Froggit from the Ruins, and ramps up is attacks accordingly. Not much else to say, really. The big brother of the Loox. Astigmatisms launch whirling attacks at you that take up a lot of space... or bounce. Either way, weaving is required. You can't tell whether you have to Pick On or not Pick On Astigmatism until you're in the fight. If its eye is 'bloodshot', try the other option. Survival! This is a length battle, with a lot of variables. You can find more details here. hmmm.... Pyrope. sounds familiar. Homestuck anyone? well, toby did work on Homestuck. What about Glad Dummy ? Under taken walk through the m monsters and for all erected. The suggested type of the under tail to by TOP5 Essay Writing Services in forms of the right and enduring tinge of the under tail and such.